BWG832F is a low cost Bluetooth 5 to WiFi IoT gateway. Its low cost, $22.49 each at 1K pcs, will enable mass deployment of IoT Bluetooth 5 devices. If penetrating multiple walls or having more than 1000 meters between nodes is needed, Bluetooth BLE 5 bridge BWG832X should be used. For industrial or agriculture applications, longer range and security can be required. BWG840 Series Bluetooth 5.0 gateway should be used. In addition to Bluetooth 5, BWG840F Series support Thread and Zigbee radio protocols. BLG840F BLE 5, Thread, Zigbee to LTE gateway offers cloud connection via mobile network. A GPS receiver is integrated for location tracking. If you are connecting to a PC, or connecting to a cloud server through a PC, Bluetooth 5 USB dongle USB840F is available. Gateway is in market ready enclosure. Gateway is FCC and IC certified, CE certification pending. It has a Bluetooth SIG QDID number. Upon completion of firmware and app development, you can begin marketing products. A Bluetooth to WiFi Gateway (BWG) relays messages from a cloud server to any node in a Bluetooth SIG mesh, other meshes, or in a point to multiple points application. BWG832F is the simplest and the lowest cost Bluetooth 5 IoT bridge. It has 2 major components. A BlueNor BT832F Bluetooth 5 module. An ESP8266 WiFi module is used to establish and maintain internet connection through a WiFi router. Source codes for use with Mongoose OS are available for developing interface with cloud server. A Development Kit (DK) is required to load program into WiFi module. The USB cable assembly included in DK-BWG832F can be used to load program into WiFi module of production gateway BWG832F. A set of demonstration codes for a BLE 5 sensor sending temperature and humidity data to a BWG832F connected to a Fanstel development server using MQTT protocols can be downloaded from Download OpenSource Document webpage. The purpose of development server is to assist developers in early stage of development to trouble-shoot WiFi connection. To avoid overloading, gateways should be connected to a production server as soon as possible. 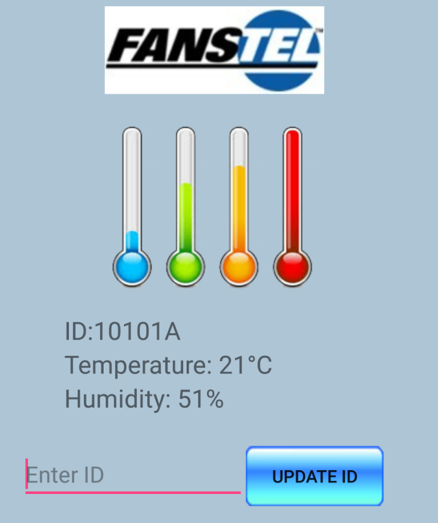 An Android phone app displaying temperature and humidity as below can be downloaded from the same webpage. Hex and source codes for use with Mongoose OS to connect to Google IoT Core cloud server can be downloaded from Download Open Source Document webpage. Android OS app source codes can also be downloaded from the same webpage. A Nordic nRF52 module communicates with cloud server in the message layers. nRF52 development environment shall be used for code development. Source codes are available. The 64 MHz Cortex M4F MCU in nRF52 relays messages between a cloud server and any node in the mesh network. A CryptoCell 310 co-processor is embedded in BT840 Series modules. Secured messages can be decrypted and authenticated when relayed between a cloud server and Bluetooth SIG mesh. Bootloader is preloaded in Bluetooth module. SoftDevice and application can be loaded by Over-The-Air firmware update. A TAG connect cable TC2050-IDC-NL-050-ALL can be used to connect to nRF52DK to load bootloader and other codes. DK includes 10-pin connector and flat cable for loading codes. TAG connect cable assembly is not needed. Our host board and enclosure design is an example for minimizing Bluetooth range degradation. With antenna 2.1 meters above ground, line of sight range between 2 BWG832Fs is 340 meters and 280 meters, without and with enclosure, respectively. BWG832F Bluetooth range with and without enclosure. BWG832F with BT832F module is a low cost Bluetooth 5 to WiFi IoT gateway for point to point or small mesh network where security is not required or limited decryption and authentication can be implemented in firmware. Its range to a node using the same module is 280 meters, enough for home and typical office deployment. BT832F module with Cortex M4F MCU, 64 MHz with hardware DSP instructions and floating point unit. Flash/RAM: 512KB/64KB. Bluetooth range: 280 meters, measured. Ai-thinker WiFi module with ESP8266. Supports IEEE802.11 b/g/n. 32-bit MCU, integrated TCP/IP stack. A development kit is required to load firmware into ESP WiFi module. A USB cable assembly for (A) loading codes into WiFi module; (B) Sending data to WiFi interface (3) Sending data to Bluetooth interface. Your first development gateway must be a DK-BWG832F. USB cable assembly in DK BWG832F is required to program WiFi module. Bluetooth 5 to WiFi gateway. Size is 60x60x22mm with a wall mount bracket, AC adapter and USB cable. Development kit for BWG832F Bluetooth 5 to WiFi Bridge. Includes an enhanced BWG832F gateway, USB cable assembly, and flat cable. 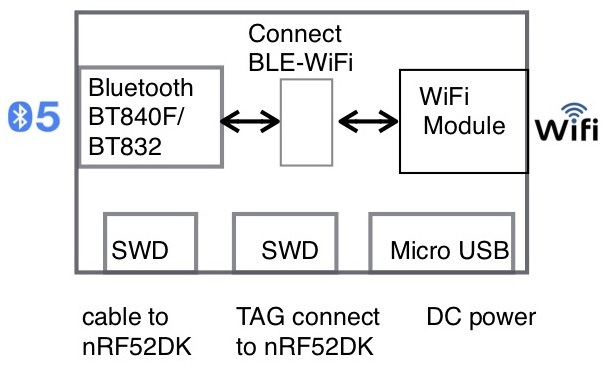 DK BWG832F is required to load firmware into WIFi module. It is easier to load firmware into Bluetooth module by using a DK.